Our first house-sitting gig on this “Great Canadian Road Trip” brought us to Vancouver Island, BC. We’d planned our route based on the house-sits we’d confirmed in the months leading up to our departure, so Victoria, BC, was our first stop. More accurately, our sit was in “Greater Victoria,” an area made up of about 8 or 9 towns surrounding the city. We were based in the small town of Langford which was mostly residential with an up-and-coming downtown area thanks to their active and optimistic mayor. We were only about 15 minutes outside of downtown Victoria, which made for an easy commute to the city, and an even easier commute to the outdoor playground that was Vancouver Island. The home for which we were sitting was in a hillside neighborhood with panoramic views of the Olympic Mountain Range in Washington State. It was strange being in Canada and looking at the US all week, but the view was truly spectacular. The house sit also included an active and hyper young poodle named Scooter, who turned out to be the best adventure companion we could’ve asked for. His brother, a 19-year-old cat named Tigger, kept watch over the house when we went out each day, typically by sleeping on the back porch or in the master bedroom upstairs. Tigger had very little time or patience for Scooter, so I think he was happiest when we left for the day’s adventures. This house-sit gave us 10 days to explore Victoria and the surrounding areas, which we quickly discovered to be a wild and beautiful island paradise. We’d visited downtown Victoria on our honeymoon cruise a year earlier and fell in love with the beautiful city, so it came as no surprise when we fell in love with the rest of the island. In true trip report style, I’ll break our week+ down into days and give you some brief highlights of our adventures. Of course, with plenty of pictures included! We spent the better part of the first two days working from the house. We hadn’t had steady Wi-Fi since our house sit in California ended a week earlier, and we needed to catch up on some work. Somebody’s gotta pay the bills, right? On Thursday night (our first night) we took Scooter for a walk at Langford Lake, a small but beautiful lake about 10 minutes from the house. We found an easy, 2 km walk around a portion of the lake that included nice boardwalks and plenty of other dogs to whom Scooter could not resist saying hello. On Friday, we took an extended lunch break and explored the Esquimalt Lagoon, a beach the homeowners had told us about before they left. We knew Scooter loved the lagoon, so we figured we’d love it too. On Fridays & Saturdays, the lagoon hosts food trucks for lunch and dinner, an event they call “Beach Eats,” so we splurged on a pierogi lunch and some ice cream before heading back to work. Since we’d worked all day Thursday and Friday, we took the day off on Saturday and headed into the city of Victoria. We found a cheap parking spot on the outskirts of the city and took off on our bikes to explore the area. Our first stop was the stunning Beacon Hill Park on the south end of the city. This 75 hectares (185 acre) park and includes everything from a peacock petting zoo to live music at the park bandshell throughout the summer. It was a beautiful park that provided an escape to nature for the city’s residents and tourists alike. From there, we happened across the James Bay Farmers Market, a small but busy market just outside of the park. Our traveler’s budget stopped us from purchasing anything, but we did taste-test some hard cider from Sea Cider, a local cidery that we later found to be popular throughout the island. Their selections were organic, boozy, and delicious...so right up our alley! We, unfortunately, didn't get the chance to tour their farm but we think it would be a worthwhile stop if you're exploring greater Victoria! The streets leading away from the market brought us out to the coastline near the cruise ship terminal. We instantly recognized the port from our honeymoon cruise and rode in that direction to watch the ships come in. It seemed most people were heading out onto the breakwater which offered views of both the inner harbor and the Juan de Fuca Strait. We ended up following the crowds and enjoying the views from the breakwater just as a cruise ship was leaving the port. On our way back toward town, we stopped at Fisherman’s Wharf, one of the best spots we found during our visit the previous summer. The wharf is home to restaurants, outdoor activity rentals, and a floating home village that Derrick and I dream of living in one day. Ever since we visited last year, we’ve had email alerts notify us of when the float homes go on sale, and we’ve been secretly plotting our little floating escape ever since. We, of course, walked up and down the wharf to check them out again before sitting down on the docks to enjoy some buck-a-shuck oysters before dinner. Unfortunately, this is where the day takes a turn for the worst. We decided to bike into the downtown area before heading back to the car and found a Busker’s, or street performer’s festival on the waterfront. Almost instantly we found a bike rack next to the Visitor’s Center with at least 8-10 bikes chained to it. We figured that was as good a place as any and locked our bikes up to go enjoy dinner and a show. After 1-2 hours on the waterfront, we returned to the bike rack to find our lock cut and Derrick’s bike gone. Of course, my bike was still sitting there for the taking, so this low-life thief knew exactly what they were doing. We later learned that there is a rampant issue with bike theft in Victoria where homeless people are being paid to steal bikes and bring them to unmanned shipping containers where they’re then shipped off for sale overseas. Faaantastic. After a minor freak-out and a report to the police, we made a claim to our travel insurance and spent the rest of the night drowning our sorrows with Scooter (who was very happy to see us). Since our day in Victoria ended so poorly, we decided to spend the next day heading over an hour in the opposite direction toward the island’s next largest city, Nanaimo. Down one bike, we researched some hikes in the area and found an awesome ocean-front Provincial Park called Neck Point just outside of town. We took a few hours to explore the entire park which offered views of both the thick Vancouver Island forests, as well as plenty of ocean and mountain views around each corner. It was the 10,000th time we wished we had kayaks since leaving on our trip. Although those probably would’ve been stolen too (still bitter, if you can’t tell). We took part in a Nanaimo tradition on our way out of town and purchased two sweet treats called Nanaimo Bars. Apparently, these dessert bars are so famous that Macklemore threw some into the crowd during his concert in Vancouver, and they were served at the White House inaugural dinner when Obama entered office. Nanaimo Bars are a delicious treat with a nut (recipes vary) and chocolate crust, vanilla cream filling (almost like a firmer Boston Crème) and dark chocolate icing on top. Unless Macklemore used a different recipe, I can’t imagine launching Nanaimo Bars into the crowd ended well for him or his inevitably sticky fans. On Monday afternoon, we took a recommendation from the homeowners and headed to the western side of the island to explore Sooke, BC. Sooke is a small ocean-side town about half an hour outside of Victoria. 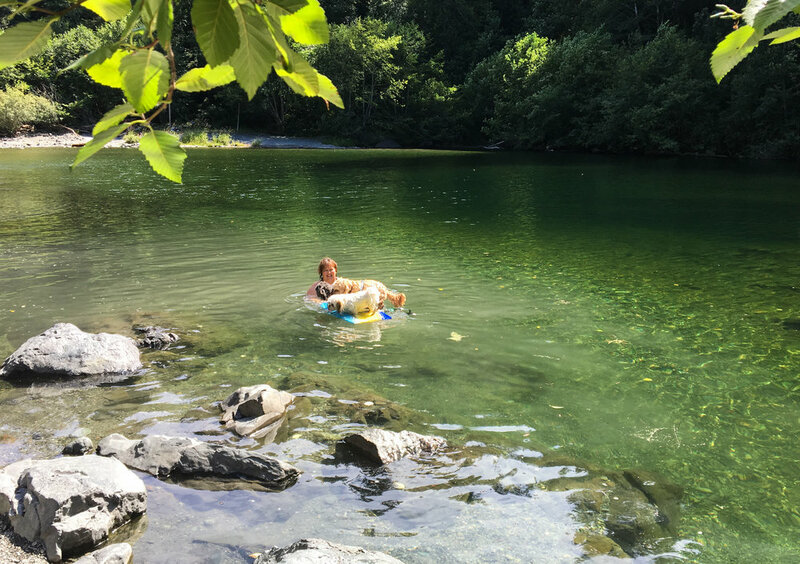 It was a hot day so we’d found a swimming spot called “Sooke Potholes” in the Potholes Provincial Park. It was an easy drive from the main road and we parked our car in the free lot and hiked into the river, where we found it somewhat challenging to find the best swimming hole. Of course, after discussing with some locals (whom Scooter repeatedly barked at), we were pointed in the right direction and eventually found some of the cleanest and greenest river water we’d ever seen. After leaving a nervous Scooter on the shores of the river, we jumped in the potholes and enjoyed a beautiful, but cold, dip in this popular spot. These “potholes” are apparently holes in the riverbed caused by large boulders carried by the current to form deep pockets of hollow rock. They were deep enough that Derrick even jumped off “Grad Cliff” (pictured above), a 30 ft rock face next to one of the potholes. Since Scooter seemed to enjoy exploring Provincial Parks, we kept with the theme and found another beautiful park just 15 minutes outside of Langford, called Gowlland Tod. We chose a longer hike up a trail called Jocelyn Hill which took us through the park and up to the summit (about 3 hours round trip). The views from the summit included the Olympic range to the front and the vast Gulf Islands in the back. It was a hot day with very little reprieve at the summit (only about 1,000 ft. of elevation gain), but the view was worth the very sweaty effort. I think Scooter enjoyed it most! We had plans to meet up with Derrick’s family friends, Dane and Savannah, in downtown Victoria later Wednesday evening so we took Scooter back to the Esquimalt Lagoon for some exercise since he’d be spending the night in. The spectacular views did not change, however, we discovered a new driftwood sculpture that had been built since our last visit. The intricate sculpture was named “McGnarly” and was a “Beach Ent” created to protect the Lagoon. I believe “Ent’s” are from Lord of the Rings, but I can’t be positive. Either way, the sculpture was impressive and you can check out the other works from the artist, Drifted Creations, here. After our walk, we said a sad goodbye to Scooter and headed to downtown Victoria to meet Dane and Savannah, two born-and-raised Victoria locals who Derrick met while vacationing in Puerto Vallarta, Mexico sometime during high school. Both Derrick and Dane and Savannah's parents own homes in Mexico and have become good friends over the years, so this connection is a small-world one that we ended up being very thankful for while on the island! Dane took us to dinner at a killer taco restaurant called Tacofino that just so happened to be within our traveler’s budget (thanks, Dane!). Tacofino got its start as a food truck in Tofino, BC (hence the name) and eventually opened up a small restaurant in downtown Victoria that Dane said has been booming ever since. Savannah was actually working at The Cactus Club, a hip restaurant downtown Victoria near Tacofino. We finished our tacos and headed to The Cactus Club, where I was introduced to my first Canadian Shaft (get your mind out of the gutter). A “Shaft” is basically an espresso martini in a shot but you drink it as quickly as you can through a straw instead of tossing it back. It was delicious and we were told it’s how a lot of people opt to start a night out. Those Canadians are smart, eh? With a new jolt of energy, I convinced the boys to do another round of drinks at a different watering hole. Dane took us to an awesome, local whiskey bar that we would’ve never found without his tour-guidance. Again, it always pays to know a local. We were the only ones in the bar which allowed us to get even more island-tips from the bartender, and end the night with some new ideas on how to spend the rest of our week. Since Thursday was mainly spent working with a quick visit to the local dog park (per Scooter’s request), I figured it was easiest to combine both days. We worked from home again Friday morning before enjoying a date night in downtown Victoria. We’d heard of an event near the cruise ship terminals called “Bites on the Barge” which was an outdoor concert event with food trucks, local breweries, and some great live music. We enjoyed dinner and drinks on the barge (truly our first official date night since leaving for our trip!) before heading home to do some planning for the upcoming week. If you’re following us on Instagram, you’ll likely know all about one of our favorite spots on the island, Sombrio Beach. We found this beach thanks to coordinates on a beer can from Vancouver Island Brewing. We’d taken a chance (with a bit of research beforehand) and drove over an hour "up-island" to this surfer’s paradise. Not only can you camp on the beach, but it’s a hotspot for surfers (especially during the fall), and part of the beach is on the Juan De Fuca trail, a wild and wet backpacking trek that many conquer each summer. We woke up to clouds and rain on Saturday morning and luckily chose to still go because we arrived to thick fog that made for the ultimate Pacific Northwest experience. Luckily, our light research before the adventure pointed us to a waterfall that ended up being the highlight of the trip. The trail to the waterfall was just a short, 5-minute hike from the beach and led us to a cavernous waterfall that you truly must see to believe. The pictures will do this beach far more justice than I ever will with words, but overall, we can’t express how much we enjoyed our day at this hidden gem that we highly recommend you visit! Overall, Vancouver Island is one of the wildest, most beautiful places we’ve explored. And we barely scratched the surface. If you’ve read our “3 Lessons” blog post, you’ll know that our second house-sit in Victoria got canceled, so, unfortunately, our plans to return have changed. However, we love the island so much that we know we will be back in the future. Hopefully to move into the float home of our dreams ;). If you liked this post, PIN IT to share with others!